Traditional methods, artisan recipe, finest French flours and sourdough gives this roll a stand out quality, great taste and aroma. 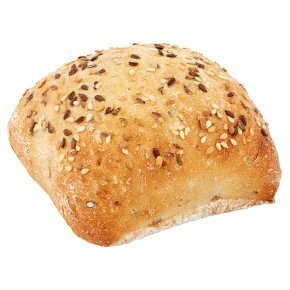 A mix of brown and yellow linseeds, sesame, oatflakes and sunflower seed give this roll a great texture and crunch to every bite. This is a wonderful sandwich roll, ideal with a range of fillings or as an accompaniment to soup. Best consumed on day of purchase. Also great when refreshed in the oven the following day. INGREDIENTS: wheat flour, water, sourdough (wheat flour, water), mixed seeds (12%) (sesame seeds, golden linseed, brown linseed, sunflower seeds), malted wheat flakes, salt, yeast, wheat gluten, guar gum, malted wheat flour.